The People’s Postcode Lottery has opened a £400,000 funding pot to applications from charities in Scotland and the north west of England. The Dream Fund programme, now in its third year, offers financial support to groups that want to work together to deliver projects. A further £100,000 has been added to this year’s fund to tackle youth unemployment. Figures from the Scottish government show that almost one in four (22.9 per cent) 16 to 24-year-olds are out of work, which is 1.6 per cent higher than the rest of the UK. Applications have also been invited for the first time from charities in Greater Manchester and Merseyside. The People's Postcode Lottery manages society lotteries on behalf of a range of charitable bodies. These trusts then provide grants to charities and community projects. Clara Govier, head of charities at the People’s Postcode Lottery, said: "We are opening the fund again with the existing three categories: encouraging active living, bringing communities together and tackling climate change. "But this year – in response to the continuing bleak economic outlook and the declining number of opportunities available for young people – we have decided to increase the support available to £400,000 specifically to help expand life opportunities available to young people." The closing date for applications is 31 October and charities can apply for up to £100,000 in funding to run year-long projects. The Dream Fund has invested £1m since it was created three years ago. The fund is run by the grant-giving trust the People’s Postcode Trust, which is funded by players of the People’s Postcode Lottery. Previous winners include Alzheimer Scotland and the Scottish Football Association Museum Trust, which were awarded more than £75,000 last year to run a football memories project across the country. 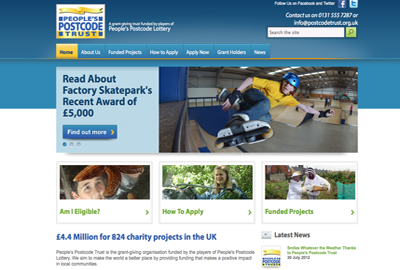 For application details, visit www.postcodetrust.org.uk.